A new rule went into effect this summer regulating the importation of hunter-harvested deer and elk to Arizona from out of state. 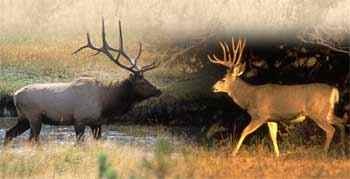 It was adopted to prevent the inadvertent introduction of chronic wasting disease and other diseases to Arizona wildlife through the actions of hunters bringing their harvested deer or elk into the state. The rule is part of the department's amended Article 3 rules which recently went into effect. Because this is the first year the rule is in effect, some hunters, meat processors and taxidermists may encounter challenges. Initially, Arizona Game and Fish officers will focus primarily on education efforts. Hunters entering Arizona with lawfully harvested deer or elk from another state will be allowed to take or ship them directly to a licensed taxidermist, or game meat processor. In every case, the scraps and nervous tissue (including brain and spinal column) must always be double-bagged and disposed of in an Arizona state-regulated landfill, or a waste receptacle designated for such a landfill. These landfills operate under the strict regulations of the Arizona Department of Environmental Quality, assuring that the potential for prion-contamination of the soil or water supply is eliminated. The new rule is expected to have minimal impact on most Arizona meat processors and taxidermists, and hunters returning to Arizona with harvested animals to these types of businesses. Most processors receive only small quantities of meat from out of state, according to a recent survey. The involvement of taxidermist and meat processing businesses that handle imported nonresident cervids (deer and elk) diminishes substantially as the distance from the state border decreases. Chronic wasting disease is a neurological wildlife disease that affects cervids (deer, elk and moose). To date, no evidence has been found to indicate that CWD affects humans, but research is ongoing, according to the U.S. Centers for Disease Control. The Arizona Game and Fish Department has been monitoring for the presence of CWD in the state since 1998 and has tested 17,000 samples since that time. Although testing has not found CWD to be present in Arizona, it has been found in the neighboring states of Utah, New Mexico and Colorado. Arizona's new rules are an additional safeguard to keep the disease out of Arizona. For more information on CWD, visit www.azgfd.gov/cwdor www.cwd-info.org.